There are a couple In Hampton Court Road that serve nothing. One side is the long tall brick wall of Hampton Court, the other side of the road is the long brick wall of Bushey Park. This section used to have a reputation as fastest part of the trolleybus system as the stops were rarely used. A ride through Bushey Park on a rush hour 152 in the Autumn was a wonderful experience, unparalleled by any other London bus route ride imo. When I say 'rush hour' I'm referring to the hours of operation rather than preponderance of passengers. On my sole journey before the route got withdrawn forever from this section I was the only passenger, and not a farepaying one either. I'd nominate the two stops called Club House on either side of Chigwell Road. They're located about 300/400 yards from West Hatch School, the terminal of the only routes serving the stops, school routes 667 + 804. I can't see any kid going to school getting off there and walking the last bit, or getting off the other way. The only thing at the stops is Chigwell golf course entrance, hence the name, and I can't see any golfer waiting for a school bus either! Totally pointless. Well, almost pointless is Pettits Lane (To Chase Cross Northbound) - only the 103 serves this bus stop and in all my years of using this bus day in and day out regardless of the time, season, frequency or whatnot, I have never seen anybody board the bus at this stop. It is not a termini stop obviously, and it is located a very short distance from Ashmour Gardens prior and Heather Gardens ahead. Only every so often, usually at rush hour, do you see one or two commuters alighting the bus at this stop but still not one passenger ever uses the stop to board the bus - even though many passengers do in this direction at Ashmour Gardens and Heather Gardens. Sloper’s Pond Farm on the 298. Very close to Waggon Road which serves a small number of houses. Serves nothing but a derelict farm. The next stop is up the hill a long distance away but there is absolutely nothing of any use between the two stops. In my days of using the 298 (every day for many years) I have only seen two people use this stop, one alighting and one boarding. On one occasion the bus driver had to brake suddenly when he realised that there was someone waiting at this stop, the driver obviously so used to zooming past it all the time! The other occasion was simply a mistake by the passenger who had missed his stop! One near me is Ferry Lane Industrial Estate - only exists in the westbound direction for the 123, 230 and N73. I think I've only seen 1 person alight there in decades of using buses on Forest Rd / Ferry Lane. Never seen anyone board there. It was also notorious for flooding during heavy rain so if you were daft enough to wait there you'd be drowned by any bus pulling in to stop. The same also applied at what is now the WW Wetlands stop but I think they've fixed the flooding issue there has they changed the road layout. More bizarre is the fact that the Industrial Estate has now been completely demolished and is having new flats built on it. Ironically it may actually get busier once people move into the flats - assuming they want to head towards Tottenham and don't opt to take the tube or Overground instead. That stop was well used back when the 232 had an excessively padded timetable (for roadworks). It was one of the few stops where drivers could regulate for several minutes without holding up other buses, which meant that everyone who wanted Brent Cross (i.e. almost the entire bus) would get off and walk from there. 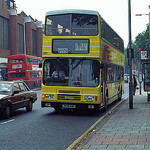 In the past it also used to be the late evening stand for the 112 as the bus station closed at 10pm. More recently I saw an entire family laden with shopping board a 232 from there - not sure how they'd got there but the driver was very surprised to see them! I’ve had a few 111s go about 55 mph on this section. Shame there are a few numpties in Richmond Borough. I nominate the two stops served solely by the W19 on Gainsborough Road in Leytonstone (between Leytonstone Station and Leytonstone Green Man/Asda). I cannot see what these stops are there to serve, being on a stretch of road boxed in by the A12 motorway one side and the Central line on the other. On the W19 journeys I have taken, no one has boarded or alighted there though on one occasion I did randomly press the stop button for this stop and the driver pulled up at the flag as normal. Not so much pointless bus stop but one thing that grinds my gears and is a waste of money is Bus Shelters at Penultimate stops on the outskirts .